Today we are delivering Linspire 7 SP1 for general release. With this release we have several fixes and changes that we have made to Linspire. With this release we have resolved many of the issues that users had with our first release. 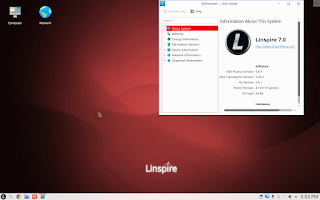 Linspire 7 is the only desktop distribution that is supported for 10 years on the desktop. Linspire is deployed by many companies, government agencies and education facilities for their productivity, design and development workstations. Linspire Server Core 7.0 now supports many HPE, Dell and Lenovo server systems. Linspire 7.0 SP1 is available today with KDE as our default desktop and XFCE for lower end and older systems. To acquire XFCE place it in your order notes. Linspire is also available preloaded on hardware. Linspire comes with 12 months of phone and e-mail support and commercial support also includes remote service and on-site service. All current subscribers and customers have received a download for the new ISO. You can purchase Linspire from our webstore. If you have any questions, comments or suggestions contact support@pc-opensystems.com or join our forums.